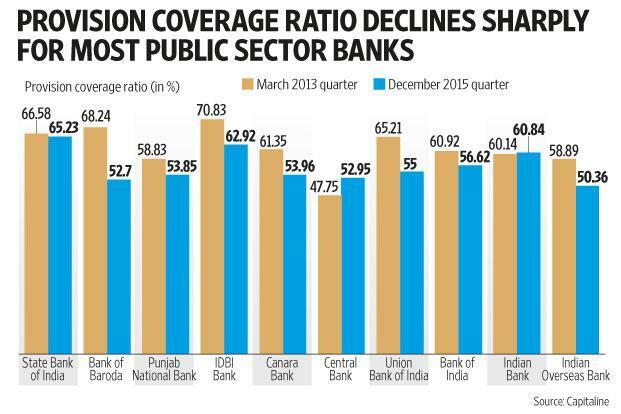 The provision coverage ratio (PCR), a measure of the funds set aside by banks to cover bad loans, has declined steeply in the past three years for almost all public sector banks. The chart has the details for the top 10 public sector banks by market capitalisation. A higher provision coverage ratio means the bank is protecting itself better against its bad loans. A decline in the ratio means that provisions have not been made to the extent of the rise in bad loans. Except for a few banks such as State Bank of India, Central Bank of India and Indian Bank where PCR has remained more or less stable or increased marginally since March 2013, the ratio has declined sharply at most public sector banks. The ratio is expected to remain low in the March quarter as well. The amount of bad loan additions will remain elevated because most public sector banks are yet to declare at least half the non-performing assets (NPAs) that need to be reclassified as under the Reserve Bank of India’s (RBI’s) asset quality review. As a result, provisions will have to be built up again, affecting bank profits for quite some time.